Fisherman never rest! Another season is here. Let’s go 2011. I have a friend heading down to work on the Tiffany Lee, so I should have some recent photos and news from the crab season down there. It can be a hard time to fish on the West Coast this time of year. Good luck, guys! 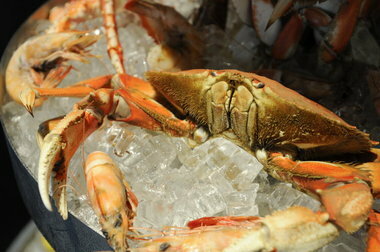 Crab lovers thrilled at the news that Oregon’s Dungeness season kicked off last week. Now, another sweet development: Oregon Dungeness crab has been certified by the Marine Stewardship Council. The London-based council’s seal of approval is meant to assure seafood buyers that what’s in the fish case was caught and handled in a sustainable manner.